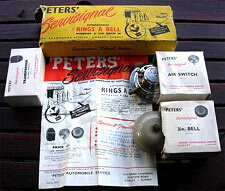 The Peters' Servisignal garage warning bell. Homepage. This page: A device designed for garage forecourts that automatically rings a bell on a car's arrival. A boxed example on the market a while back. Poring over old accessory catalogues can turn up information on some neat gadgets that were designed for either the private motorist, or as in this case the commercial garage owner. The description of the Peters' Servisignal was found in a catalogue dating to 1972, but judging by the look and feel of the illustration, I'm sure it can trace its roots back to the 1950s, if not earlier. Its purpose was to alert the garage owner of a car's arrival on their forecourt. This would enable the owner to greet his next customer, and attend to their needs - whether it be dispensing fuel, checking their oil level, or simply topping up the level of coolant in their radiator. Although becoming less and less common, there were still garages in business in the 1970s that offered this level of service, a throwback to the early days of roadside garages where customer service was key, and tended to ensure repeat business from local motorists. Any driver pulling onto the forecourt in his car would set off a warning bell within the garage. An added benefit of the system was that the opportunity for a rogue to steal perhaps a tin of oil, or gallon of motor spirit, was greatly diminished. Nowadays CCTV tends to take care of forecourt security, but in the happy days before Big Brother surveillance, I'm sure a gadget such as the Servisignal - assuming it actually worked - would have been of interest to many roadside businesses. Automatically rings a bell whenever a car drives in. A suitable length of special rubber hose is laid across the approach to the pumps and connected to the airswitch. As a car crosses the hose air forced through the switch rings a bell. Switch resets itself after a short ring. Supplied with mains transformer, air switch, and 3" bell. Driveway hose (proofed against oil and petrol) available in 15', 30', 45' or 60' lengths, charged extra. The transformer, air switch and bell cost, in 1972, 4.60, while extra hose was available at five pence for every one foot of length. 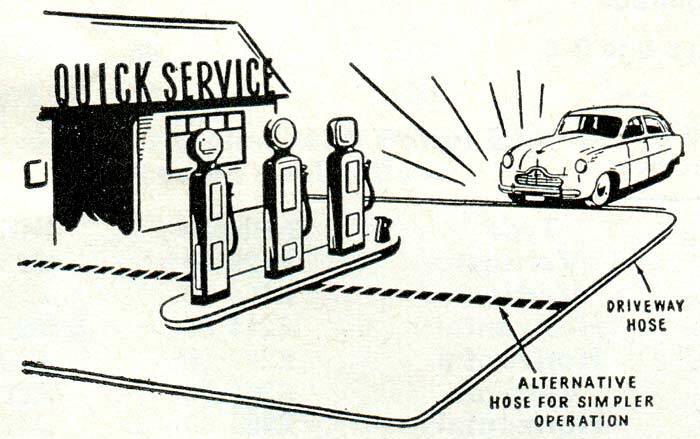 The illustration shows both the driveway hose, encircling the forecourt, and also a simpler system whereby a flat hose acts as a pressure pad, close to where cars would pull up at the pumps. I wonder how effective and resilient to the weather this system was? Are there any Servisignals still in operation, or at least still fitted albeit no longer in use in garages anywhere? It was produced by, or on behalf of, Peters' Automobile Service, of Old Bank Chambers, Station Road, Horley, in Surrey (now home to an insurance company). An example turned up on eBay Ireland a little while ago, so there's at least one example still out there even if not in service. An unused example of the Servisignal surfaces. My thanks to Charles now. He sent news of an unused boxed example of the Servisignal that he stumbled across. It was found at a garage sale of all places. 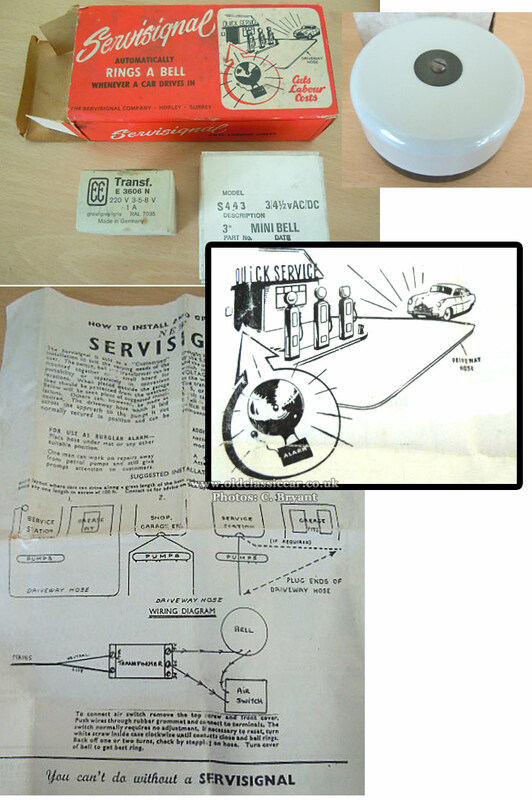 The packaging looks to be a little later than the example shown at the head of this page, but is probably still 1970s in date. Instructions in the pack suggest possible arrangements for the rubber hose, which is laid around the forecourt, over which any visiting motorist has to drive, triggering the bell. The driveway hose was available in four lengths (between 15ft and 60ft), and a condition of the Servisignal warranty was that only the factory hose must be used in the installation.